Whether you ordered 23andMe to learn more about your ancestry, or to participate in research, or to connect with relatives, every 23andMe customer can learn something about what makes them unique. Our Customer Care team, gets a lot of questions regarding first steps you need to make to access this information. Hopefully we can clarify some of these important questions here. When you receive your sample kit for the first time, there are a few important things to notice. One of the first items you will see when opening the sample kit will be a piece of paper enclosed within a plastic casing. This paper is hard to miss – it displays a big red “STOP” message. However, as we all can imagine, this message can still be overlooked in the excitement of receiving the kit. The process of providing a saliva sample can sometimes be more difficult than you might think. If you or anyone you are assisting is having a difficult time proving their sample within a 30 minute period, the tips and tricks found here. • Is your sample contaminated? Feel free to rinse out the collection tube with water and allow it to air dry as long as the buffer fluid in your kit’s funnel lid is still intact. • Missing a biohazard bag? The sample can be mailed back to the laboratory in a ziplock bag. Just be sure to replace the funnel lid with the small cap. • Did your buffer fluid spill? The liquid found in the funnel lid liquid in the funnel lid is a buffer fluid necessary for sample viability during transit to our laboratory. If you did not include the buffer fluid to your saliva sample, it is unlikely that our laboratory will be able to process your sample. First of all, it is important to note that placing an order does not mean an account has been created or the sample has been registered. Placing an order, creating a 23andMe account, and registering your sample within your 23andMe account are three three separate processes. So heed the message, stop and before doing anything else register your kit using the unique 14-digit barcode found on the side of the sample collection tube. The registration process must be completed before the sample reaches the laboratory. The sample will not be processed at the laboratory unless it has been registered to a 23andMe account, so don’t skip this important step. The registration process ensures that sample is connected to your account and that it is done so in a way that protects your privacy. That’s something that we here at 23andMe take very seriously. The barcode number you use to register your kit helps to ensure everyone’s data is not only protected, but also linked to the correct individual. To protect each of our customer’s privacy, the laboratory even removes and discards any identifying information included with a saliva sample before any testing personnel receive the sample. Another important part of this registration process is that you don’t mix up kits. You must make sure that you are using the barcode from kit to which you provide your saliva sample. Sometimes couples or family members mistakenly mix up the kits they are registering. 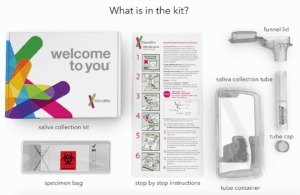 It is most important to make sure that each individual being genotyped uses the collection tube from which they have registered or intend to register. Before we move on, we want to cover a few more questions we receive all the time regarding registration and account creation. If you haven’t already set up a 23andMe account, you can do so at the registration link. If you have already set up a 23andMe account, you can click “sign in” instead, and then enter your barcode. Once your 23andMe profile has been created, you are free to modify the information at any time using the edit profile button found in the drop down menu under your account profile name. Now that your sample kit has been registered to your 23andMe account, it’s time to spit – provide your sample. We can use saliva because there are a large number of white blood cells from which we extract your DNA. This means eating, drinking, brushing your teeth, biting your cheeks etc. within 30 minutes of submitting your sample could affect the quality and quantity of your white blood cells.